If you are in need of dental implants you might have noticed through your research there are several different options. Depending on your needs and desired outcome each one will work differently. 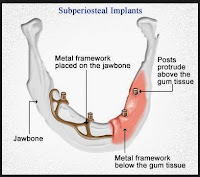 The two main types of implants are endosteal and subperiosteal. Knowing the difference between these two will help you decide which one is right for you. takes 2-4 months. When fully healed these implants will function and feel like normal teeth, due in large part to the implant being fully osseointegrated. 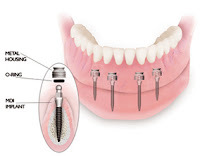 This implant is completed in several steps. In the first step,u the dentist will cut the gum away from where the implant will go and put a screw into the bone. A metal cylinder is then placed on top of the screw, which is where the crown will be anchored. The gum is then sutured back into place and allowed to heal. Once the patient returns, a crown can be made and will attach to the screw. Endosteal implants can also be used to support dentures and will be able to be removed by “snapping” them on and off the implants. 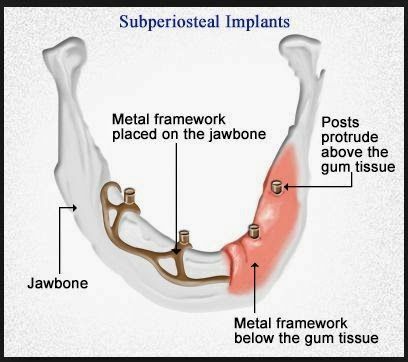 Subperiosteal implants are implants that don’t use a screw but rather a metal framework (as seen in the picture below) placed under the gums. 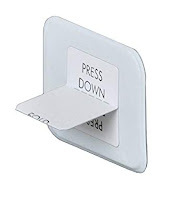 Similar to endosteal implants, the dentist will cut the gums back and lay the framework supporting the implant prongs on top of the bone and suture the gums back around. The gums will grow around the framework of the implants with the top of the posts showing through the gums. The crowns can then be placed on top of the prongs and the patient can resume normal function. These implants are generally used when a patient doesn’t have enough bone structure to support an implant. Just like the endosteal implants, they typically take around 2-4 months to completely heal. Mini implants (like the ones shown on the right) are endosteal implants but much smaller (they can be the size of a toothpick). Due to their small size, the implants can be placed in only one visit and do not require any gum surgery. However, they cannot support chewing in some areas of your mouth. 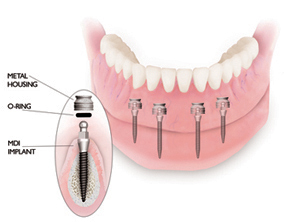 Generally, mini implants are used to simply stabilize dentures, as opposed to anchoring a crown. Regardless of which type of implant you choose, our staff at Jackson Family Dentistry will make you comfortable throughout the whole process. All of our implant procedures start with a consultation where you can meet the surgical team and ask any questions you may have. If you are thinking about getting implants, give our office a call and let us give you a rewarding smile.